Master of the stage Fame game. IT WAS a long way from play acting in his bedroom when the curtain went up at the Kings Theatre. Aaron Steadman watched nervously as he became the youngest ever producer of the hit musical Fame. The 16-year-old realised his dream of producing his own show before an audience of more than 600 people. The youngster from Hayling Island even received a letter of support from David De Silva, the creator of both the stage show and the film. Aaron used to go regularly to pantomimes at the Kings Theatre, Southsea, with his parents. He recalled: 'As I sat there as a young child with a wild imagination, I dreamt of being on that very stage, just to be part of that magic. And tonight my dream has come true. 'I still don't believe it now, knowing this is my show is crazy and unbelievable. Aaron set up his own production company in 2001 and staged his own panto, Jack And The Beanstalk. His company has more than 30 members aged 14-18 from Hayling Island, Portsmouth and Waterlooville. 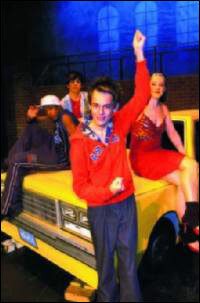 Aaron, who also plays Joe Vegas in the show, attended theatrical workshops and classes from a very young age. He was also a member of Chichester Festival Youth Theatre. After studying GCSE drama, dance and art at Hayling School he is now taking a Btec in musical theatre at South Downs College. He then hopes to enter a stage school in London and one day would love to produce shows in the West End. Kings Theatre promotions officer Sandra Smith said: 'It is so exciting to see such a young company at work. 'Aaron asked if he could put a show on and after we had seen his work we agreed. In April Aaron will play Hysterium in A Funny Thing Happened On The Way To The Forum for Hayling Musical Society.